People that have read some of my other book reviews may know that I tend to attack the to-be-read list slowly and in a disorganized fashion. Sometimes, it takes me forever to get to books I most anticipate, but I must say that Francisco X. Stork's Marcelo in the Real World officially has the award for longest time on my TBR: About four years. For one of those four years, it was sitting on my bookshelf. And let me tell you, this was basically at the top because I was extremely interested in it, so I don't know how I let this happen. 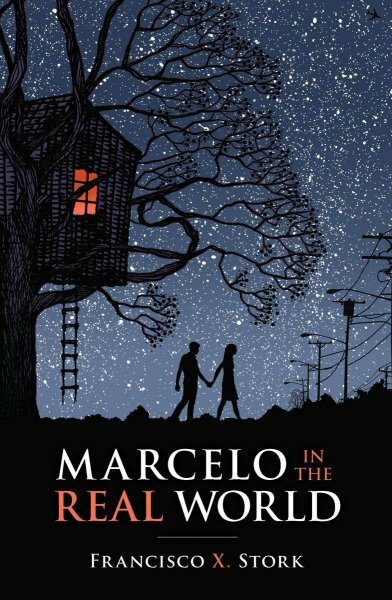 All I know is that now, I'm kicking myself in the arse because Marcelo in the Real World is now one of my favorite books of all time, no questions asked. Marcelo has a form of autism. Social situations make him very anxious, he tends to speak in third person a lot, he frequently quotes the Scripture, and he can hear a mysterious music in his head. These characteristics make him a bit different, and he's gone to a school for kids with special needs his entire life. But even his doctor says that he'd be fine in any given public school setting. His father wants him to take advantage of the fact that he's a high-functioning individual and could go to public school if he wanted to, so he has Marcelo work in his law firm for the summer to see how he handles it. During this time, he meets Jasmine, whose general persona heavily contrasts with the rest of his co-workers. Together, they make discoveries concerning the law firm's current problems as Marcelo is finding out what type of person he can be amid the peer pressure thrown on him by a worker with an unhealthy infatuation with Jasmine. "The real world" can be a horrible place, but one photograph leads Marcelo down a path to discover how to deal with it. I could not put this book down. It's been a while since I've read a book so utterly perfect, and I'm not entirely sure how to effectively put my love for it into words even though I've been dying to talk about it ever since I began reading. First of all: This story has so much depth. I mean that in terms of plot, characters, and emotion. Francisco Stork made everything and everybody so complex and real, which is why this book couldn't have possibly been any better. If Marcelo felt something, I felt it too. The nervousness, the butterflies, disappointment... Everything. Marcelo and Jasmine were crafted so vividly and naturally, and I loved them as characters. They're great people in general, and Marcelo's innocence is impossible not to love; it hurt to see him discover how awful the world can be. And Aurora - what a sweetheart. But Stork also made the unlovable characters with emphasis, which is why I disliked them so much. I wanted to kick Wendell - I'm sure you can all guess where. His father was a jerk too, but Wendell was more prominent throughout the story. He's a creepy perv, just like Jasmine described, and he kept trying to take advantage of Marcelo's signature innocence to get him to do whatever he wanted. Marcelo's father, Arturo, also made me angry quite a bit. I understand that he wanted to believe that Marcelo never had any differences, but I don't think he ever accepted reality of respected those existing differences. But really, a lot of people pissed me off in this book because of how the treated Marcelo. And what's worse is that I know that people are like this outside of this book. Considering how many rotten aspects of the world is highlighted in Marcelo in the Real World, I expected this to be an extremely depressing book. Even though there were definitely parts that saddened, worried, and angered me, the concept of dealing with the negatives with positives really shined. People like Marcelo, Jasmine, Jerry, Ixtel, and Aurora are constant reminders of that. Plus, Marcelo and Jasmine's somewhat-indirect romance kept my heart fluttering. Anyway. I've never read about anybody autistic before, so this type of POV was new to me. I was fascinated by the scientific aspect, the music in his head caused by activity in the temporal lobe. The concept of a boy that can hear this music in his head is one of the main factors that attracted me to this novel in the first place, actually. I loved the musical and religious aspects. Marcelo in the Real World is so well-written and deep... I don't think I've ever encountered a novel so incredibly underrated as this one. I would've at least thought that the gorgeous cover (it's one of my favorite book covers of all time) would've attracted the masses, and then even more because people would've discovered that the story is just as amazing on the inside as the outside, but I digress. I'm perfectly happy having this book all to myself. I'm seriously considering going back through my Goodreads and changing some of my five star ratings to fours because of how mesmerizing this book was. I feel bad for the next book I read because perfection is certainly one tough act to follow. I loved it beyond what I'm capable of expressing.